1861 QV 1d rose-red (SG.1var), fine used example of the rare DOUBLE IMPRESSION with full colour pmk'd full black horiz. "A10" (PML.1), off centre to left. Ex GILBERT-LODGE (1962). Also illustrated Robson Lowe (Jan/1965, Lot 1028) as "double impression" and described as "a remarkable stamp". Peter Jaffe (2006, Lot 88, 89) had two used "double impression" examples, neither copy anything like as pronounced as the example offered which realised £400 and £270 respectively plus buyers premium. 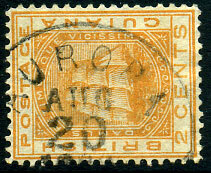 1881 QV 3d yellow-buff Crown CC wmk (SG.10, Cat.£60) showing positioning of duplex cds, fine used. forged CASTRIES cds dated C/JU 10 96 on manuscript cleaned 1891 QV 10/- dull mauve & black (SG.52, Cat.£300). 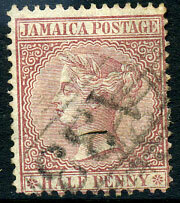 Type PD14 in red dated 8 FE (1)884 on stampless piece. 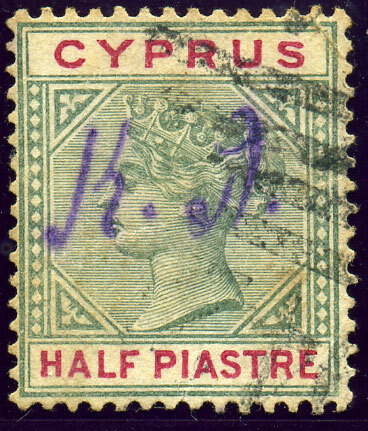 in purple ink on QV ½pi Crown CA wmk showing SG unlisted SHAVED TOP "S" in CYPRUS (SG.40var) overstruck light "942" numeral, small corner crease and minor toning. dbl-arc dated JY 16 1878 on 1877 8c rose OFFICIAL (SG.010, Cat.£450). on QV 2c on 4c carmine (SG.118). (11 bar) in red on 1d (SG.2), minor corner crease. (16 bar) on 6d rose (SG.5). 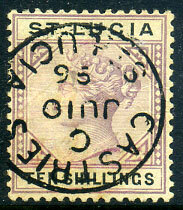 (11 bar) in red on 1884 2d pale bistre (SG.50). 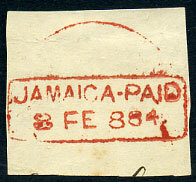 the ST. LUCIA B/JA 18 03 forgery on 1891 QV 1/- (SG.50). Close match to Ritchie handbook Page 59 illustration, rarely found. 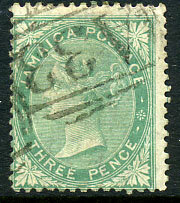 (PML.3) in brown ink on 1866 “bluish shade” 1/- slate-grey P.11 to 12½ (SG.8, Cat.£900.00), fine used centred left showing portion adjacent stamp at right. 1899 QV 5/- green & blue (SG.75, Cat.£170 used), a forgery believed to have been cleverly executed by the Belgian forger Smeets by bleaching out the design of used copies of the 1886 Ceylon QV 5c dull purple (SG.195) to a give a "blank" CA wmk P.14 stamp; only immediately given away by the indelible ink KURUNEGALA (Ceylon) and MR 24 95 dated cds which could not be removed. on QV ½d CC wmk (SG.7). on QV 3d CC wmk (SG.10). on QV 4d CC wmk (SG.11), blunt corner perf. (T.5) MR 19 88 (ERD) on 2c orange CA wmk (SG.171). (T.3) AU 23 87 on 2c orange CA wmk (SG.171). 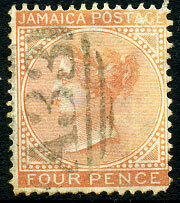 (T.1a) JU 15 without year on 2c orange CC wmk (SG.127). (T.1a) AP 1 84 on 2c orange CA wmk (SG.171). (T.1a) JA 5 80 on 2c orange CC wmk (SG.127), very rare. 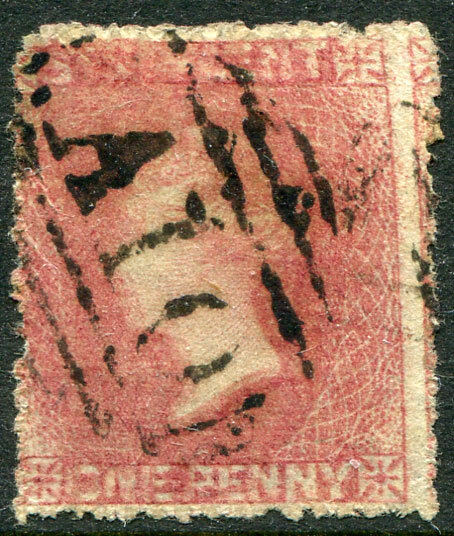 (T.2) AUG 20 1880 on 2c orange CC wmk (SG.127), very rare. (T.3) AP 11 87 on 2c orange CA wmk (SG.171). 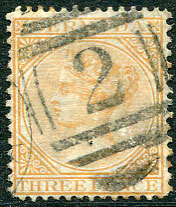 (T.2) 31 JAN 1880 on 2c orange CC wmk (SG.127), very rare. (T.12b) FEB 11 1902 on 2c (SG.234). (T.5a) JY 17 84 on 2c orange CA wmk (SG.171). (T.3) MY 21 80 on QV 2c orange CC wmk (SG.127), early use. newly discovered brass seal on ½d (SG.205), some clipped perfs, currently unique. 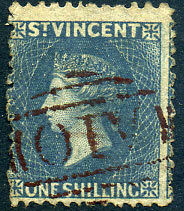 (A1) bluish ink part dated 24 SE(P 88) on 1/- (SG.183).